The UN is focusing on women at work for International Women’s Day 2017 – highlighting the gender pay gap and urging bold women to stand up and make a difference. It’s an opportunity to focus on the unique challenges faced by women with disabilities in the world of work – from accessing education and training, to finding and keeping employment. Misconceptions and barriers mean that women with disabilities experience a threefold daily challenge: they are women, they are people with disabilities and they are women with disabilities. These challenges are multiplied further if they are from developing countries or under-developed areas, are refugees or have been forced from their homes. Firstly as women, they encounter the general discrimination that all women face – such as the 24% gender pay gap the UN is highlighting as part of its Women’s Day focus. They are more likely to be affected by poverty, poor health and inequality, as well as being underpaid. Secondly, as people with disabilities, they face the challenge of being significantly less likely than the general population to be employed. There is a lack of recent statistics from developing countries to corroborate this – one of the reasons why Sightsavers is passionate about the collection of disaggregated data . But past research has shown a large gap between the employment rates of people with disabilities and people without disabilities; and the 2011 world report on disability confirms this worrying trend. The under-employment of people with disabilities is, of course, not confined to developing countries. A study carried out in the EU in 2013 found that fewer than half of people with disabilities were employed, compared with nearly three quarters of people without disabilities. Finally, as women with disabilities, they face an even bleaker picture. Women make up two-thirds of the world’s 1 billion people with disabilities, but are less likely than men with disabilities to find employment. Again, there is little formal data about the employment rate of women with disabilities in developing countries. But the same 2013 EU study found that 44% of women with disabilities were employed, compared with 51% of men – a gender gap of seven percentage points – and there is every reason to believe the gap in the developing world may be much wider. The absence of inclusive policies and programming remains a challenge within entire countries as well as in individual workplaces. Even where these policies exist, they are often not implemented. Seventeen of the 25 states which have not ratified the UN Convention on the Rights of Persons with Disabilities (PDF) are developing countries. Even in states which have ratified it and have reported on their progress, there are often unresolved issues on education, employment and women’s empowerment. Women with disabilities generally still don’t have the representation they need, despite the best efforts of many organisations. This is true at the grassroots level and globally. For example, in the 2016 elections to fill nine places on the UN’s Committee on the Rights of Persons with Disabilities (CRPD), in which I stood as Ghana’s nominee , all the successful candidates were men, resulting in a committee membership of one woman and 17 men. Some women choose – or are forced by the lack of alternatives – to set up their own businesses. The results are inspirational stories like that of Steph , who became an entrepreneur because it was difficult for her to find a job after graduating from fashion school and going blind. For women with disabilities in the developing world, these challenges are even more staggering. The impact of “ableism” and sexism is intensified by the economic situation. Women with disabilities are the last people to be thought of in any discussion of economic empowerment, because of stigma, discrimination and the fact that there are few resources to be shared among everyone else, and so the “strongest” prevail. This year the UN is celebrating bold women who stand up and make a difference. As women with disabilities, we want to be bold and stand up for our rights and our futures, and our ability to earn money and support ourselves and our families. Sightsavers works with many such bold women. 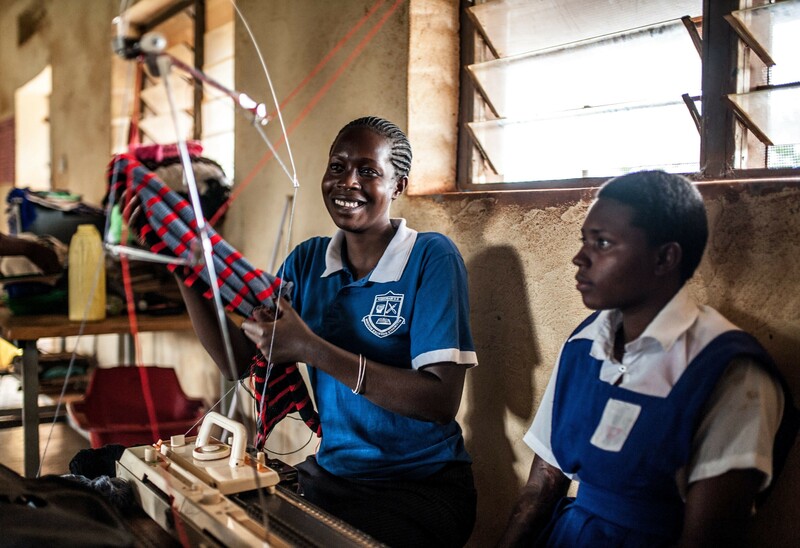 Some of them are leading initiatives and projects, women like Rita Asaba , a graduate of Sightsavers’ Connecting the Dots training programme, who teaches blind and partially sighted students at Kamurasi Demonstration School in Uganda. Some of these other bold women are simply challenging stereotypes in their own families and communities. Why does this matter? It’s not just vital for us as women, but for what we can contribute to our local and national economies. With the population of Africa forecast to double to 2.5 billion by 2050, this issue is of critical importance to literally hundreds of millions of people and to the economies of countries across Africa. All economies – not just those in developing countries – would gain from gender equality in the workplace. For example, one study found that gender equality could add trillions to the US economy. The UN’s target is to achieve gender equality in little more than a decade – Planet 50:50 by 2030. Nearly every country in the world has also signed up to the Sustainable Development Goals – ground-breaking pledges covering key areas like gender equality , health , work and reducing inequality – which also come with a delivery date of 2030. The needs and rights of women with disabilities must be placed centre stage if these ambitious challenges are to have any chance of succeeding. 1. Campaign. All women share a responsibility to change policy and change attitudes. We can highlight the situation and call for change globally, nationally and locally – for example by joining our Put Us in the Picture campaign, which is working to ensure that people with disabilities are not overlooked in the global development agenda. 2. Count. Promoting the need for disaggregated data is vital if the problem is to be fully recognized and tackled, and progress measured. 3. Share. See colleagues with disabilities as equals – all women share this responsibility, don’t patronize, equalize. 4. Be yourself, no matter what they say. If you’re a woman with a disability, don’t be defined by how others see you. Become a woman of boldness – become one of the people the UN is celebrating this year by living independently, learning, preparing for work, and working to the best of your abilities. Check out the World Blind Union’s Project Aspiro , a comprehensive career planning and employment resource designed for people who are blind or partially sighted, but also a valuable resource for others. 5. Employ. If you’re an employer, decide to be part of reversing these trends. Become a ground-breaking employer who looks for people’s skills rather than looking at their disabilities. And if you think it’s too costly to hire people with disabilities, check out these success stories from the World Blind Union’s Project Aspiro.